Yes, that, not who. This isn’t that kind of post. The whole that/who thing is a pet peeve of mine. People are “who”s, not “that”s. So, yes. The one that started it all. Last Wednesday saw the re-release of the first book I ever wrote, Honor Unbound. I share authorship of it with Diane Abbott, who did all the research for the book. This turned out to be fortuitous because I pretty much hate research. Unless I really, really, really need it, I won’t. And because this is a historical book, the story needed it. I figured since most people who are familiar with my work under the pseudonym Kage Alan will have never heard of Honor Unbound, I’d give you a little background on how it came to be. I graduated from GVSU back in 1993 and one of my degrees is in Creative Writing. I’d tried writing a book the last couple years in school and the results are quite embarrassing. Downright awful, actually. The idea is sound, but the results of my efforts are hysterically bad. Anyway, I received a call from one of my former teachers in high school. 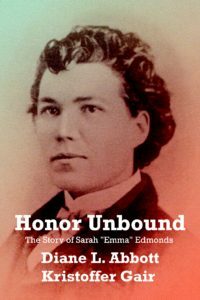 Diane had completed a huge amount of research on a historical figured named Sarah “Emma” Edmonds and wanted to write a book based on the research. She just didn’t quite know how to start it. We talked for two days and I gave her a couple of ideas how the story might be structured. Diane gave me a call a couple of weeks later and asked if I’d write it. So, for 2-3 years, I’d stop by her condo after work and I’d write. If I needed any research done or little details, she’d run with that side of things. Being a co-author never appealed to me. History never appealed to me. The problem is I had no idea what I wanted to write and had no real desire to do much more on the book I’d been writing at GVSU. So I figured this might help me figure out what I might be capable of. “Emma” was born in Canada, had an abusive father who arranged a marriage for her, and she escaped with the help of her mother. She thinks her father might come after her, so she leaves Canada altogether, this time disguised as a male, and comes to the US. The Civil War begins and, still disguised as a man, “Emma” enlists and fights as a nurse and spy. And, yes, she’s a real person, not a figment of our imagination. Fortunately, she wrote a book of her own based on her experiences, so we could reference her own observations and words. We finished what we felt to be our final draft and started submitting it the old-fashioned way. This is before the internet. We had to send out actual letters to agents and publishers and include a self-addressed, self-stamped envelope to boot. What did we get in return? More often than not, poorly photocopied rejection letters. This went on for a year. I started writing A Funny Thing Happened On The Way To My Sexual Orientation during that time and found a publisher for this book before we could for Honor Unbound. And since I knew Honor Unbound would be published one day, I decided to write my own books under the Kage Alan pseudonym so the stories could remain separate and not color each other. The mid to late 90s wasn’t exactly known for being kind to the LGBT population then, much less so than now. We did eventually find a publisher and sign a contract. Unfortunately, the one thing the contract didn’t stipulate is a price. The publisher slapped a $44 price tag on our softcover book and our contract stated we had to sell 1000 copies before we’d ever see a penny. We obviously never saw a single penny. Finally, last year, we went through the process of getting our rights back, went through the book again, found errors, did a bunch of editing, and while it may still not be perfect, it’s in much better shape. We have a new cover by J.P. Adkins, and Honor Unbound is now available on Amazon and a bunch of other sites. This is the first of several re-releases I have planned for 2018. Distancing myself from the Kage Alan pseudonym after years of marketing the name hasn’t been easy. I feel like I’m starting over from scratch, but starting over I’m doing. And it feels right to go back to the beginning with Honor Unbound. I hope you give the story a chance. I did when I wrote it. This entry was posted on Sunday, May 6th, 2018 at 8:55 am and is filed under Book Promo. You can follow any responses to this entry through the RSS 2.0 feed. You can leave a response, or trackback from your own site.